These days I run on caffein and Avocado Toast! A couple of years ago my priority number one was cooking healthy food. Not only did my opinion about the term ‘healthy’ change massively over the time also my focus changed. As much as I love cooking and spending time in the kitchen I am currently transitioning in a phase of my life where I am less self-paced and more stressed. As a result cooking is taking a backseat. Let’s talk about priorities for a second. It might sound odd. After all I am sharing recipes here on a regular basis. But this week I had to sit down and reprioritize. I never have my priorities in a reasonable order but I can’t afford that for the next few months. So I made a list of all the things that are going on in my life and put them in order. I focus on the top 5 for now and do only what’s strictly necessary for everything else. My first and foremost priority is finishing my thesis. I still struggle treating it that way. Socializing made it on the list. I can’t shut myself away completely. I forced myself to put it on there. It only made #5 though. Cooking was something I wanted to have on it but it’s time not to be stubborn for once. I negotiated hard but it was the reasonable choice. I feel so adult! But what does that all have to do with Avocado Toast? As much as I was open to negotiate how I spend my time I was not open to negotiate my food. I don’t want to eat boring food. I don’t want to eat unhealthy food. But it has to be a quick and easy fix and it has to consist of staples so that I don’t have to go to the grocery store every day. Meal prepping isn’t my thing because I get bored easily. My staple food has to be versatile. This is where finally Avocado Toast joines the game. 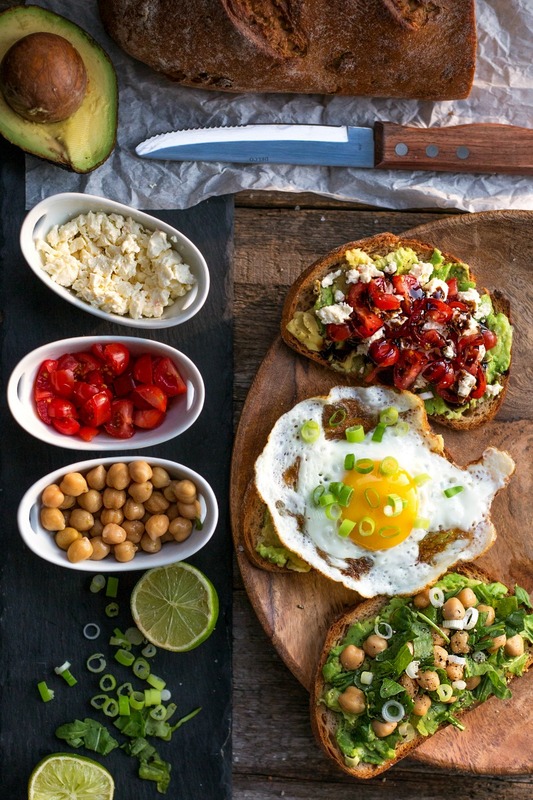 No matter what day of the week when you open my fridge and look at my counters you will always spot bread, tomatos, avocados, eggs and cheese. If I have these things at hand I know I will never be hungry or dissatisfied. White wine and coffee also make this list but that’s a topic for a different post. Back to Avocado Toast. Next to being super basic a huge fan of anything avocado a sandwich always satisfies all my cravings. I am a sandwich person through and through and bread is my #1 carb of choice. 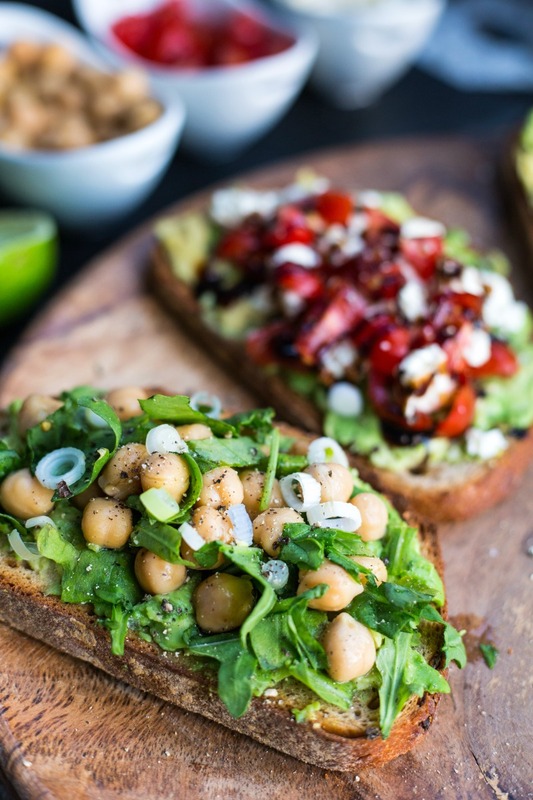 But what absolutely makes me gravitate towards Avocado Toast these days is the fact that I can create three different taste experiences in under 10 minutes. Beat that! These recipes follow all the same scheme. We have the same Avocado Toast as a base and then pimp it up with different topics. 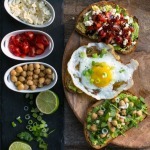 Each of the recipes is a combination of carbs and fat thanks to the Avocado Toast base and has a topping rich in protein. I am a sucker for being well fed in under 10 minutes. All three recipes are vegeterian and one is even vegan. All three recipes make my taste buds happy and appeal to my texture loving foodie self. All three recipes also take away every excuse for not focusing on my thesis now. Damn it! Short in time but still in need of a healthy meal? 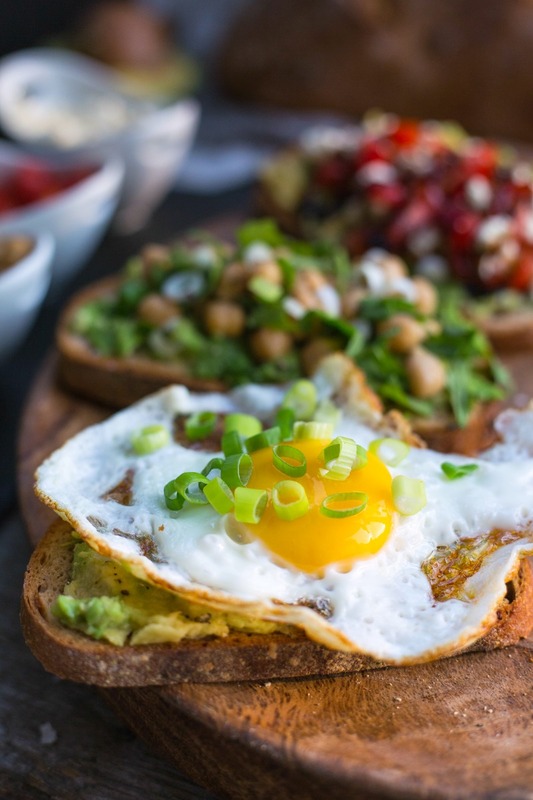 This Avocado Toast recipe is delicious and nutritious and includes 3 different options - Ready in 10 min! 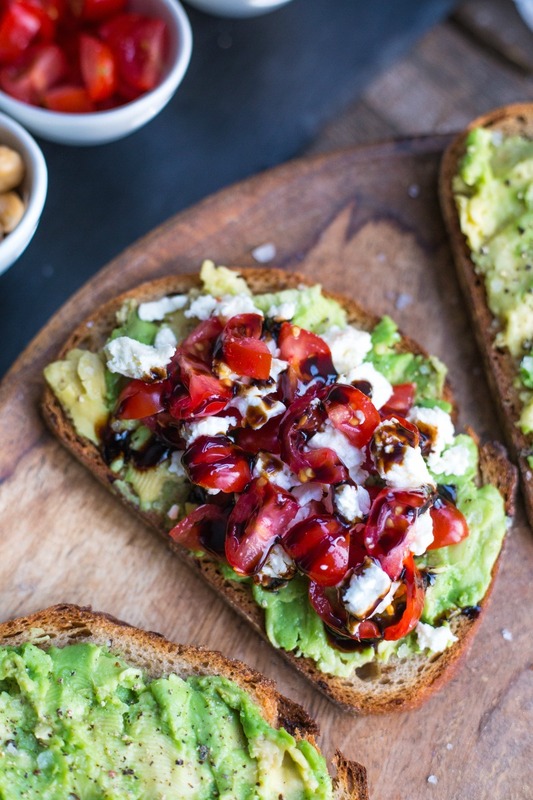 What’s your favorite way to eat Avocado Toast? What’s your go-to meal when you’re short in time? Do you put lemon juice (or anything else) on the portion of avocado that you don’t use to save it from discolouring? Just wondering because I plan on making this this week. I usually don’t put any lemon juice on the leftover avocado. Apparently the avocado pit has a substance in it that prevents the avocado from browning. So I always keep the leftovers together with the pit in an airtight container in the fridge. The flesh will brown a bit but not too much. You got it in one taking your top 5 priorities and simply focusing on those for the next few months. I actually think if more people did that then there would be a lot less stress in the world. We can’t do everything! 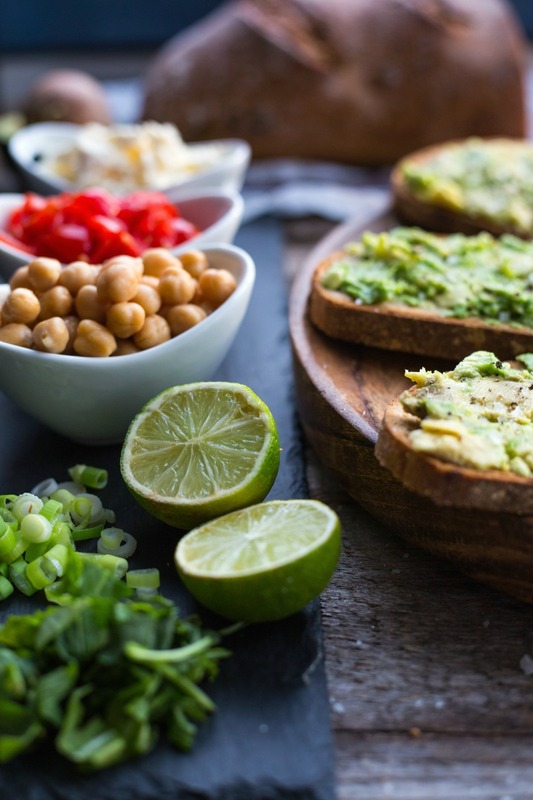 Avo toast is so good – I love mixing mashed avo and cottage cheese… It’s so good and makes the avo go even further! Yum! That’s true! We can’t do everything. I think setting and committing to priorities is the first step and then the real hard work begins. I wonder how much it will stress me when I actually have to say no to non-priorities. I never had that combo on a sandwich. But I have topped salads with both. Avocado and hummus is a great combination as well. I need these in my life, all of them. I feel like I might love them equally and I know the perfect bread to make them on: Breadsmith’s Onion Rye. So very good.